Pteridophora alberti Meyer, 1894. Mountains on the Ambernoh (= Mamberamo) River, Irian Jaya, subsequently restricted to the Weyland Mountains. 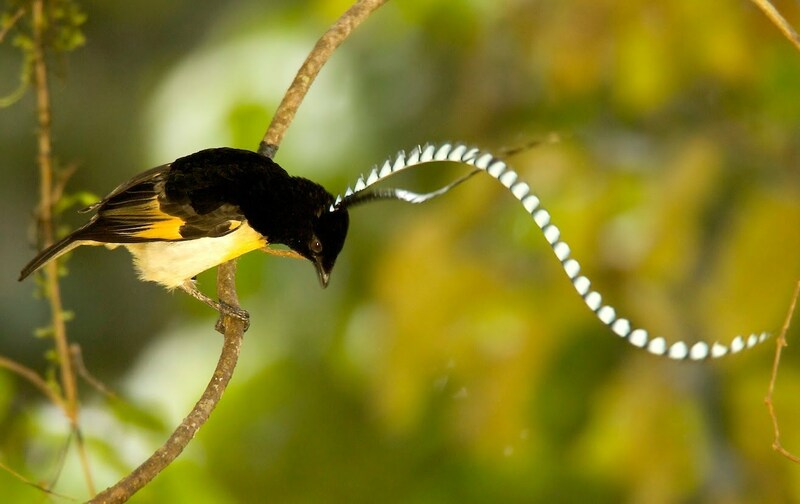 English: King of Saxony’s bird of paradise, enamelled bird of paradise, enamelled bird; French: Paradisier de Prince Albert; German: Wimpeltrдger; Spanish: Ave del Paraнso Rey de Sajonia. 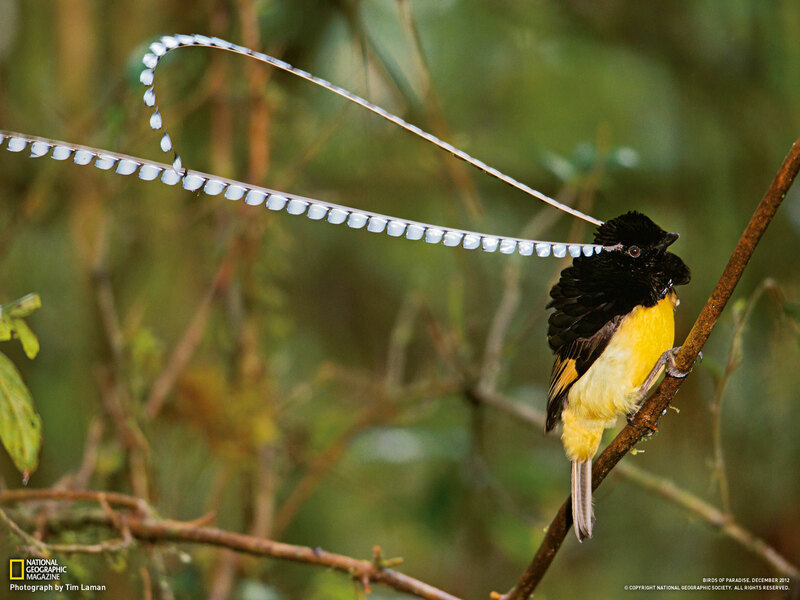 8.3 in (21 cm); 19.7 in (50 cm) if head plumes of adult male are included; female 0.15–0.19 lb (68–88 g), male 0.18–0.21 lb (80–95 g). Head, mantle, and back is deep black with dark, bronze-green sheen. Occipital plume behind each eye has a bare central shaft with 40–50 “flags” decorating its outer side; the upperside of each is blue while the underside is brownish. Chin and throat is black with highly iridescent violet tips. Breast, abdomen, and vent dark yellow; brownish rump and tail. Females are brownish gray with black-barred white underparts. Western and central two-thirds of the central cordillera of New Guinea, from Weyland Mountains of Irian Jaya east, possibly to the Kratke Range of central Papua New Guinea; at altitudes of 4,590–9,350 ft (1,400–2,850 m). Mid to upper montane forests and their edges, including lightly disturbed habitat around hunting lodges and tracks. Adult males typically solitary and territorial, but in some areas they may aggregate into exploded leks. 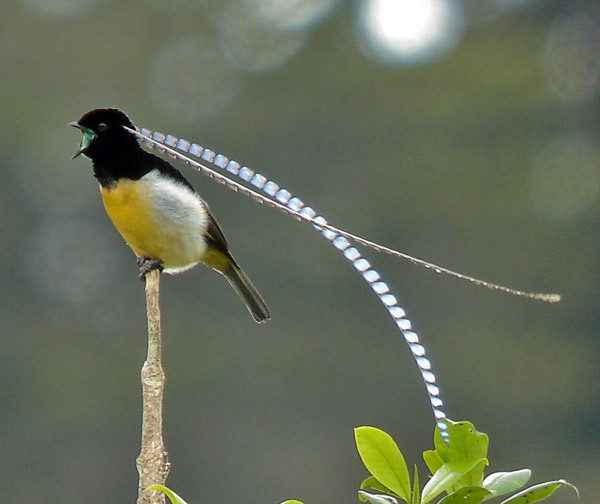 Adult males advertise vine tendril display perches from perches in the canopy above, giving odd radio static-like advertisement song. 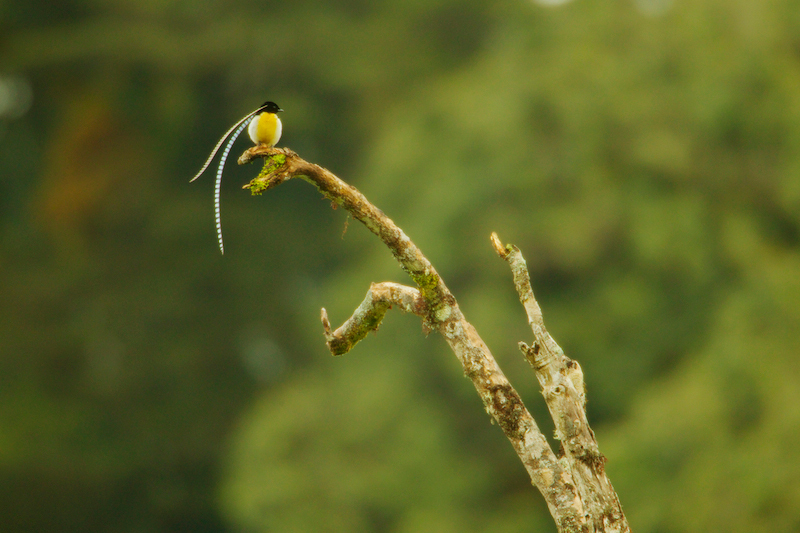 A bouncing courtship display is typically subsequently performed upon a suspended vine a few meters from the ground. Singing and display seasonality occurs at least from September to April. 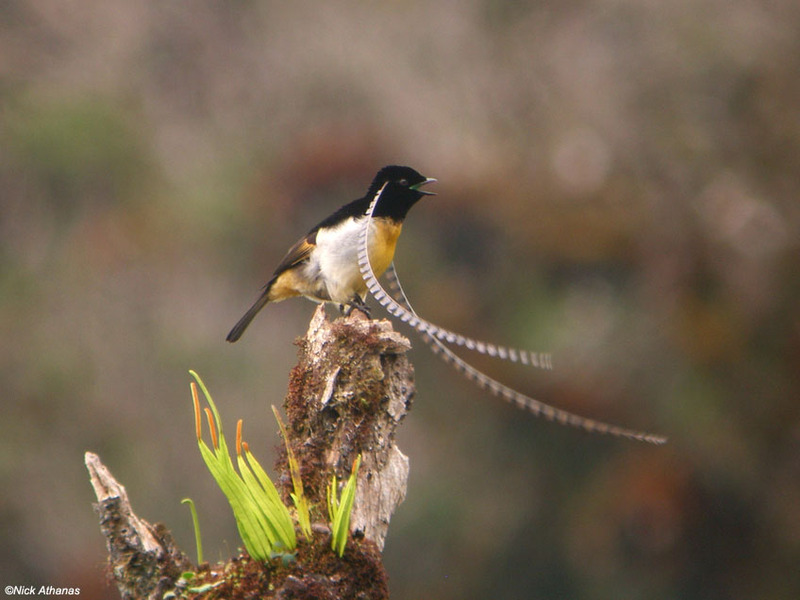 Female plumaged birds are far less conspicuous than adult males. Omnivorous, but predominantly frugivorous. Favors green fruits, with a particular liking for those of false figs (Timonius). Forages mostly in the canopy and subcanopy. Polygynous, with promiscuous males and exclusively female nest attendance. Breeding is occurs at least from July to February. The only observed nesting occurred during late December to the end of January. The nest is a shallow open cup and the only known clutch was a single egg. Incubation is more than 22 days; nestling period is unknown. Not threatened. In general, widespread and common in most areas of appropriate habitat. The two elaborate head plumes of adult males are sought by highland men as personal adornment. However, cut-out photocopies of them are sometimes worn, suggesting hunting pressure might be in decline.